Despite the growth of Cambodia’s fledgling tech sector, few women have joined the field. Longtime Cambodian tech observer Sok Sikieng says although more women are joining the industry, discriminatory barriers persist. A lecturer of information technology at the Royal University of Phnom Penh who was recently appointed "Technovation Ambassador" by Iridescent, an international non-profit education group that links mentors to students, Sikieng, 29, told the Hello VOA (Khmer) radio program last week that the increased number of women working in the technology sector has not encouraged more young women to pursue tech-related majors in college. Among 1,500 students who chose information and communications technology (ICT) at the Royal University of Phnom Penh in 2014, she adds, less than 10 percent—or just 105—were female. Sikieng, who has worked in the field for almost 10 years, lays blame on a lack of role models, social stereotyping and family pressures, all of which contribute to diminished self-confidence. While Sikieng was fortunate to have a supportive family encourage her professional interests, Cambodia's tech sector is still perceived as male-dominated. 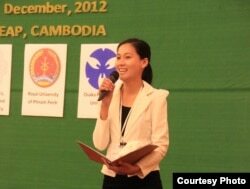 Female Cambodian role models that defy stereotypes, she says, are critical to changing that perception. 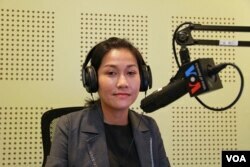 Ms. Sok Sikieng, Technovation Ambassador in Cambodia and Lecturer of Information Technology at Royal University of Phnom Penh discusses "Opportunities and Challenges for Cambodian Women in Tech" on VOA Khmer’s Hello VOA “New Voices”, May 16, 2016. The stereotype of male dominance is not unique to Cambodia's tech industry. The American Association of University Women recently reported that U.S. female computer science majors fell from 35 percent in 1990 to just 26 percent in 2013, and that women constitute only 12 percent of American engineers, a decline that contrasts with fields such as medicine, law and business. Despite making up half of Cambodia's student population, women comprised only 14 percent of 2010 information technology graduates. Most of them, she adds, chose the subject without a clear goal of professionally entering the sector. Even she chose the subject by chance rather than long-held passion. The main reason for the lack of enthusiasm, she said, is that discrimination can be more pervasive in the classroom than the workplace. According to Khiev Sokmesa, a senior software developer at Phnom Penh-based InSTEDD iLab, the slight increase in Cambodian women engineers is already changing attitudes among his male colleagues. Combined with Cambodia's recent pivot to the so-called STEM curriculum (science, technology, engineering and math), which aims to better position the country’s workforce for a tech-centered economy, progress is likely. For young professional women such as Sikieng, the ability to overcome these societal challenges is rewarded with numerous opportunities in a currently uncompetitive field. More importantly, those women will become role models and encourage female students to become the tech pioneers of the future. 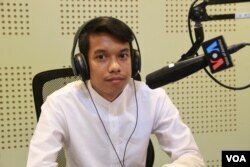 This report was produced in collaboration with VOA's Khmer Service. Aun Chhengpor contributed reporting from Phnom Penh.